Sensi Wi-Fi Thermostat is rated 4.0 out of 5 by 44. Rated 5 out of 5 by Kasia from My Dad Loves It I recently got this for my dad as a gift and he loves using it. Rated 5 out of 5 by John from Simple Easy To Use After rebate the stat is very cheap, works very well, easily connected to phone application. Rated 4 out of 5 by middle class from good stuff Had it for a month, bought it becasue the engergy saving rebate program, this is the cheapest smart contral you can buy from that rebate eligible list. and it works pretty. Rated 5 out of 5 by Lorne from Great value compared to other wifi thermostats Very simple to set up! We are very happy with this product! Rated 5 out of 5 by Pat Tech 73 from Great Value Works awsome Installed this in my home, Garage and apartment Can view and control all 3 if need be By my Phone Anywhere in the world... Great buy extremely easy to install and use on My I phone love it! can you manually raise or lower the temperature from the thermostat or do you have to always do it from your smart phone? Hello BJ207, Thank you very much for your question. The answer is yes, you may operate the thermostat like a typical manual thermostat from the wall as long as you do not have the Keypad on Lockout. We hope that this answer helps, and please do not hesitate to reach out to us with any other question or comments. Best regards. I have the sensi thermostat and it is going through the batteries within 2 months. noticing in the thread the stat should work off the power from the furnace. What needs to be done in the stat for this to happen? You will need to have the wiring checked between your furnace and the thermostat. We had that same issue and found out the guy who installed our furnace had not wired the thermostat to the furnace correctly. How often do you have to replace the batteries. Hi Dw0124. Depending on their usage, your batteries should last between 6 months to a year. Do the batteries supply power for internet if there is no c-wire? Hi Dw0124! With a conventional HVAC system, your thermostat will utilize your system to power the Wi-Fi radio and should only use the batteries as back up. If you have a heat only or cool only system, your thermostat would require a 20-30VAC common wire to help power the Wi-Fi radio. Hi there, Can i switch between AUX and EM. heat manually? Does it need a outdoor indicator to do that? Thanks. Hi JJCheng. 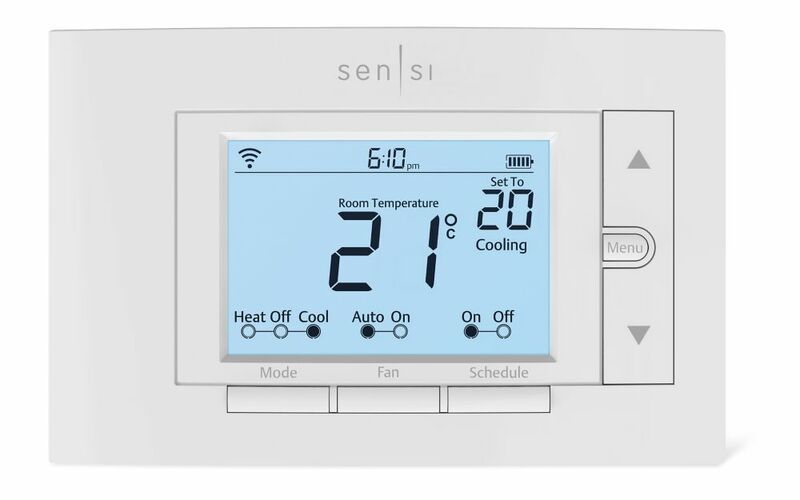 Sensi uses a system performance based algorithm to sage between your heat pump and your Auxiliary heating and does not require an outdoor sensor. Hi - I'm wondering 1 - how to set it for a vacation then awaken it to my regular program a day before I return and 2 - the Celsius scale does not seem to show half degrees (eg 22.5). Do I need to use the Farenheight scale for increased sensitivity? Hi Terry T! To have your thermostat hold a specific temperature, you will simply need to set the Schedule to Off, and when you are ready to run the schedule again you will just need to switch the Schedule mode back to On. You can use Farenheit for a more accurate temperature reading. Hope this helps with your questions! Will this work with a 240 Vac Dimplex fan wall heater? Hi KEBKR! Sensi is only compatible with 20-30VAC, as it is a low voltage thermostat. Hope this helps! I've 8 wires that're connected to the following on my old unit lables: white to the W1, yellow to the Y1, red to the R, black to the 24(c), Orange to the O, blue to RS2, brown to RS1, and Green to RS+V. Do I have to connect all of them?